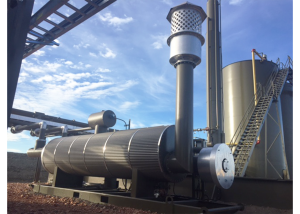 The Steffes Indirect Heater is a safe, reliable, and cost effective heating option for tanks, treaters, and pipelines. This solution provides efficient heat by warming glycol and pumping to the desired location. It can also be used as a line heater for heating process fluids. It eliminates the need for fire tubes and can be placed just outside the containment system. Never worry about inefficient heating, fire tube failure, or freezing pipelines again!